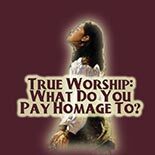 True Worship: What Do You Pay Homage To? What is worship? What you pay honor and attention to, what you think about, is what you worship. If there is grumbling and complaining in your heart, you have priorities other than Him. If you are a God-seeking servant, then the other things fade into the background.